Then the princess was moving behind him, one hand across his mouth even as the other brought the dagger up, close to his throat as she dragged him back. Chriani was startled, as much at being grabbed at all as he was at the strength in her arm. As he stumbled back, though, he felt instinct override any uncertainty. 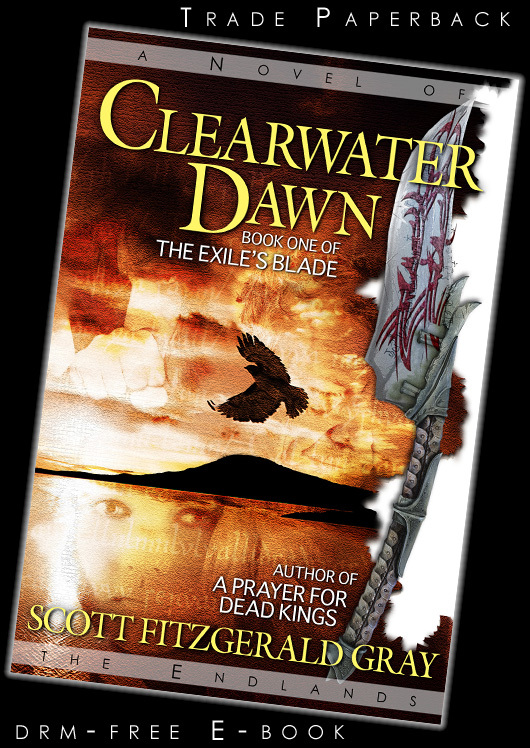 Her blade was a hand's-width from him, more than enough space to go for her wrist. No room to get a decent strike in with the other hand, but her flank was vulnerable and in easy reach, or the soft muscle of her thigh, one sharp blow that would drop her. But even through the instinct, through all the memory of all the hand-to-hand training he’d done at Barien’s side, he knew he couldn’t do it. No idea what any of this was about, but he couldn’t hurt her. Not anymore. An apprentice guard in the royal household of Brandishear, Chriani is a capable young warrior held back from attaining his full potential by a lifetime of dark anger. Lauresa is a princess about to be set aside as heir and married off for the sake of treaty — and the first woman Chriani ever loved. When his mentor is murdered preventing an assassination attempt within the palace, Chriani is forced to become Lauresa's protector, the two reconciling a forbidden passion even as they are caught up in a maelstrom of political intrigue, ancient racial hatred, a society living in mortal fear of sorcery — and a decades-old plot to plunge five nations into genocidal war. From behind him came a low hiss. A sharp exhalation, a sound of fury and frustration that carried even over the thud of hoofbeats and the horses' rasping breath. The hissing turned to words that rang out behind him. One of the Ilvani, his voice twisted by rage as he screamed an oath. We hunt the vile, we hunt the hateful. We hunt the Ilmari. The Valnirata's hatred of the Ilmari and their homelands ran deep, and gave their epithet laóith a dozen subtle meanings. Chriani didn't understand the warrior as he shouted again, though. "Lóech arnala irch niir! Lóech niir!" He risked a look behind him. The Ilvani warriors always fought in silence. No battle cries, no orders ever heard. He saw the rider three lengths back, snaking through the thinning screen of trees. His hair was long streaks of grey and gold, tied tight and flowing fast behind him, his eyes flashing molten gold in the half-light. His leather was cut away at the shoulder for ease of shooting, his bow up and a black arrow at the string, set dead on Chriani. On the wrist of the Ilvani's bow arm, a blood-red light was flaring. "Chriani irnash! Lóech arnala irch niir!" It happened slowly, as it always did. A year and a half has passed since the dark road that took Chriani across the Clearwater Way and back, at the side of the princess he once loved. Despite the anger and ambivalence to duty that once held him back, rank and commission have taken him to the frontier of the Greatwood and riding with the rangers, Kathlan at his side to help him focus on the challenges of a soldier's life. But when Chriani finds himself targeted by Ilvani hunters tied to an ancient prophecy that might upset the balance of power in the Ilmar, it forces him back to the unresolved pact that binds him to the Prince High Chanist — and down a new road whose secrets might destroy the life Chriani and Kathlan hope to build. Available as a DRM-free e-book at Amazon. Trade paperbook and other e-book formats coming soon. 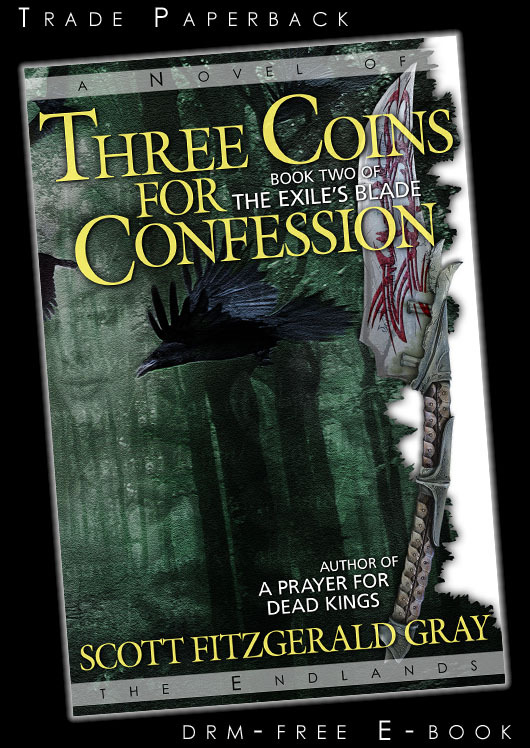 The Exile's Blade trilogy was the first novel series set in the Endlands — a wide-ranging fictional world in which the energy and narrative wonder of epic fantasy collide with William Faulkner's human[oid]-heart-in-conflict-with-itself at high speed.